Beachwood First Floor Apartment furnished to a high standard.It is our second home and fully equiped to make your stay a special one. 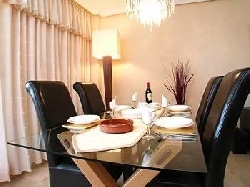 The complex is a small development that is gated and secure. There is an underground car park with direct lift access to the apartment no struggling with heavy suitcases or shopping. The spacious stylishly furnished lounge offers comfortable leather sofas, dining for four, subtle lighting patio doors leading to main terrace. 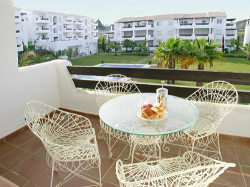 The main terrace equipped with sun loungers, reclining chairs if you want to relax and sunbathe in private. The master bedroom with king size bed has a patio door leading onto the main terrace and benefits from an ensuite bathroom with separate shower and bath. 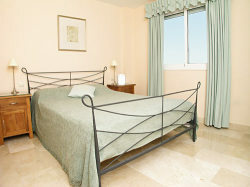 The guest bedroom has two single beds fitted robes and a guest bathroom. The kitchen is fully fitted with access to the second terrace through a patio door. The second terrace is ideal for those outdoor breakfasts in the Spanish sun, or al-fresco evenings with beautiful views over tropical gardens, swimming pool and mountains. 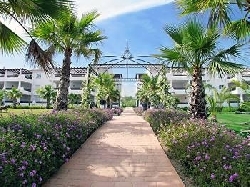 Selwo complex is set in tropical gardens and benefits from a gymnasium and sauna for your use. 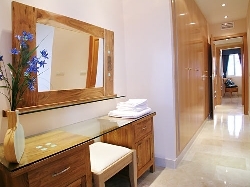 Perfect for those healthy holiday breaks at no additional cost or you could just laze by the pool and pamper yourself. The natural local beaches described as part of the 'New Golden Mile' are minutes away. A car is recommended for this holiday, the location however is central for most activities. Ideally located between the beach and mountains within close distance to the Traditional Spanish White villages and blue flag beaches situated between Estepona and Marbella the area of Selwo. A short walk away is Selwo Animal Adventure Park a centre for animal conservation. A pleasant day where you can take a stroll down a nature trail or jump in a jeep to view a variety of animals in their natural surroundings. The sunny coast of Andalucia where there are over 320 days of sunshine every year. There is something on offer for everyone. Just a short drive from Selwo you can enjoy the luxury lifestyle of Puerto Banus where the luxury yatchs are moored. Away from the beaches you can experience life in true Spanish villages such as Casares, Mijas, Rhonda and Istan. 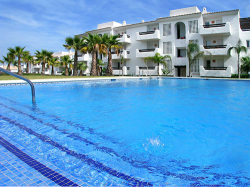 Also nearby are aqua parks, seal-life centres, boat trips and numerous golf courses. Esepona is a short drive away with beautiful beaches the beach Playa de Cristo is particularly safe for children with it's shallow waters. 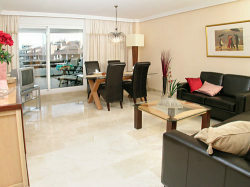 The apartment is ideally situated for experiencing life on the Costa del sol. The Sierra Nevada mountain range wraps the coastline with a continous beautiful view wherever you go. Air-conditioning / heating is available a small supplement applies. Fans are provided in both bedrooms for the summer months.